Actually you might be waiting a while... Like the other passenger elevators, the center court elevator appeared to be permanently decommissioned. 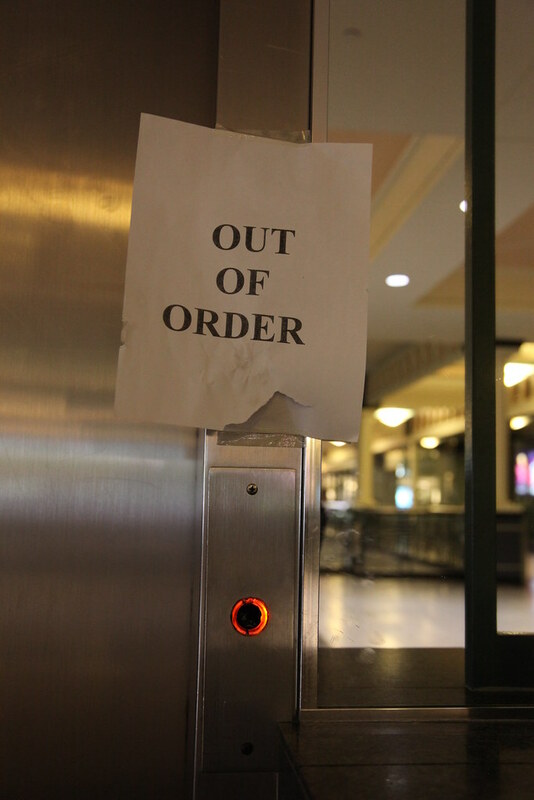 An "out of order" sign hangs above the call button. Fortunately, this elevator was retired with a relatively good safety record. However, having been built in 1969, it pre-dated code changes in 1972 that required hydraulic elevators to have "life jacket" mechanisms. Prior to 1972, code permitted a single hydraulic piston without a safety device. In the event of a cylinder seal breach, the elevator could catastrophically fall. And, although hydraulic elevators are obviously limited to short service heights, it still could lead to falls just shy of free-fall speeds in the right circumstances. It is unlikely that this elevator was ever retrofitted to have such a safety device installed, considering that this elevator didn't even have Phase 1 fire service! This is a particularly interesting machine because although it is a hydraulic elevator, the machine room and hydraulic pump are actually located on the roof. This was an unusual design consideration for a hydraulic elevator, however, it is rather obvious that it was done because there was nowhere on the first floor to locate the machine room, since the elevator was basically free-standing in the center of the mall's atrium. It would have been awkward to have a small machine room jutting out on any one side, so they simply put it on the roof.